OhMyVera! 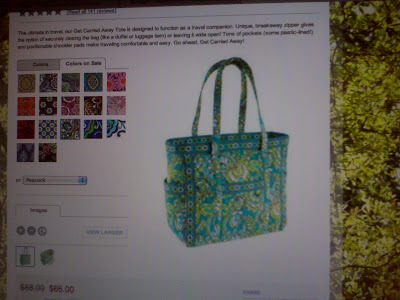 A blog about all things Vera Bradley: Old Colors in New Styles! Maybe you have already seen this on verabradley.com, but if not you might be interested in this. Vera Bradley has been making some of its newer style bags in colors that were previously thought of as retired. Maybe we were the only ones that considered them retired though. This is great news for some of you who love Mesa Red, Riviera, Botanica, Pinwheel Pink and Peacock! Click on the linked names to go to the VB website to check them out! For example the Get Carried Away Tote, it is being made in Mesa Red, Riviera, Botanica, Pinwheel Pink and Peacock! Those colors were already retired (or on sale) when they started producing the Get Carried Away Tote. Those colors are also on sale for $66. Another example is the newly restyled Hipster that is now in Mesa Red, Botanica, Riviera, Night Owl, Pinwheel Pink and Peacock! Those originally were made in the older style hipster. Those are on sale for $42. Also check out the Lets Do Lunch, I believe the baby bag was restyled since these colors were retired (I could be wrong) and PLEATED TOTE!!! If you see any other styles that werent created yet when these colors were out, please share in the comments. I can't take credit for this discovery. Some of my Vera friends were talking about it and a couple Oh My Vera readers let me know as well. Thanks everyone! I did notice it and thought i was out of my mind... OH MY VERA am I excited! Pinwheel Pink is what brought me to Vera.. it was my first love so I'm excited to see they're continuing its legacy!!! That's fantastic! I love the Mesa Red! I may have to get a newer style in that color! Thanks for the heads up! Thanks Jennifer!!! So excited to finally have 100 Google Followers!!! AND...today thru Sunday (4/10) take an additional 20% off sale items plus Free Shipping for orders $100.00 or more. Thanks Allison for the updates!